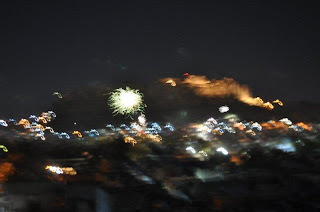 We spent New Years Eve in Jodhpur and even managed to stay up past midnight. During the day we got an autorickshaw to the Mehrangarh Fort. Built in the 1400's its walls are massive and there are many rooms and courtyards to see. Rooms are painted, carved, filled with mirror work and stained glass windows. There is an excellet museum full of well displayed artefacts such as elephant howdahs for the royals to sit upon an elephant, and carved palanquins that royals would be carried around in. There are interesting displays of armoury, swords, weapons, and paintings also. The kids loved the swords and knives especially one their Aunt and Uncle had told them about - the weapon shaped like scissors would be stabbed into the abdomen. Then, the attacker would open them like scissors to make a second cut inside. Basically the intestines would be ripped to shreads and fall out. Lovely. There are great views of the blue city from either side of the fort and large cannons on the ramparts. We took the path and walked back to town. Each night in Jodhpur at 6:00pm we would go to the rooftop and have a beer and watch the sunset and the moonrise. But before sunset we would hear the call-to-prayer over the loudspeaker of every mosque in town. One mosque would start and then another and then everyone of them in the entire city. It was one of those magical sounds that filled the night and we would rush back each night to hear it. Planned to go to Pal Haveli for dinner but it was packed with tourists so we went to a smaller place next door with equally good views and adequate food. Back at our haveli we watched Mamma Mia on the laptop til just before midnight and then moved up to the rooftop for the countdown. A beautiful, clear night with an almost full moon. As soon as midnight struck the fireworks started all around us and into the distance. 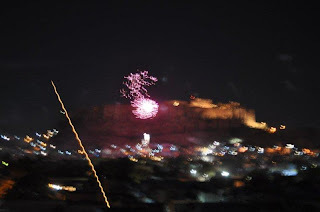 The fort and palace were lit up and the fireworks lasted about twenty minutes. It was a great way to bring in the New Year.